Northerntruthseeker: A Radical Rethinking Of "Conspiracy Theories" Is Underway Globally! Well said. Reminds me of Gary Allen's summing up in None Dare Call it Conspiracy - if you are not a conspiracy theorist then you are a "coincidence" theorist. I agree if you are not a conspiracy theorist, then you are a coincidence theorist. There is no other view to have. Trouble is the controlled establishment which is engaging in the great conspiracy against humanity are desperate to convince us there is no conspiracy and everything that happens, well, just happens by random chance, coincidence. 'Yes there are those who are conspiring against us but it is never the establishment. Oh no! We the establishment are the good guys who are fighting these evil Islamics, Commies etc in our war on terror to protect you!'. I mean think about it people. How can you have a 'war on terror'??????? WAR IS TERROR! SHOCK AND AWE, REMEMBER????? Its like trying to put the flames out with gasoline, you only make it worse. Yet people have accepted this charade and go along with the propaganda because they are too cowardly and afraid of ridicule. Well the most ridiculous story ever told was 9/11. We are supposed to believe that a loada bearded camel jockeys (no offence) outwitted the CIA/MOSSAD/MI5/6/NSA/PENTAGON when they couldn't even get a CESSNA off the ground! C'mon Israel you must be getting frustrated about your efforts going unrecognised. 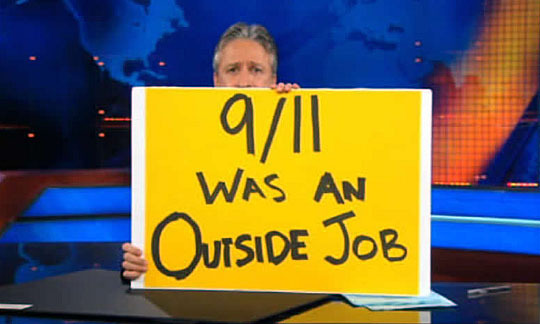 I mean 9/11 was a masterpiece in post modern coute d'etat and you let those cjs take all the credit for your hard work!!! C'mon you conspirators when are you going to take the credit for your efforts instead of bestowing it on the cjs! WILL THE REAL CONSPIRATORS PLEASE STAND UP.